ETL tested to UL/ULc standards for automatic doors used on fire and smoke barrier doors. Electrohydraulic units are used in applications where doors are typically operated manually but can also be activated via wall switches, motion sensors, etc. for automatic operation. Operates as mechanical surface closer during close cycles or if power is turned off. Onboard power supply to handle multiple system peripherals. 24VDC @ 1.3A output for connection of electric strike, lock. Obstruction Detection - Motor stops if door is obstructed during opening or closing. Push and Go feature - as the door is manually opened, the operator "senses" movement and opens door to the full-open position. Modular construction for easy, one person installation. 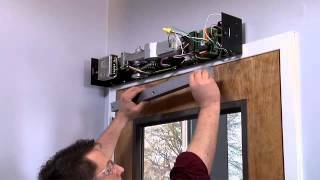 The many features the 6000 series Powermatic low energy door operator are designed with the user in mind, this operator features simple to use electronics, an onboard power supply and easy integration into access control systems. This 6030 model installs on the push side of a door and it will allow the door to swing open a maximum of 110 degrees.